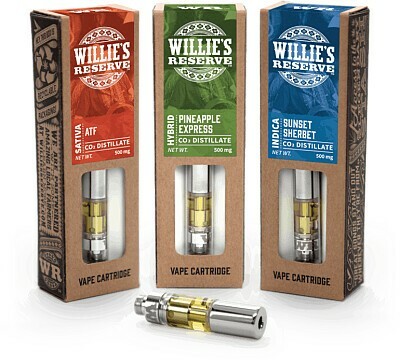 WILLIE'S RESERVE™ pre-filled cartridges contain pure CO2 cannabis distillate with cannabis derived terpenes. That means no fillers, no cutting agents or any other flavorings. Each variety is expertly crafted to express the naturally occurring flavor profile from our favorite strains. It’s a vape experience true to the original. WILLIE'S RESERVE™ cartridges work best with the beautifully branded WILLIE'S RESERVE™ 3.6-volt battery and charger. Enjoy!